Midfielder Kevin McBride has left Dundee, with the club saying the exit was "by mutual consent". The 33-year-old only made seven appearances this season and has not played since December. McBride has made 72 appearances since joining Dundee in 2012 and has twice helped the Dark Blues win promotion. But Aberdeen midfielder Nicky Low,Falkirk striker Rory Loy and Alloa Athletic left-back Daryll Meggatt are to move to Dens Park this summer. 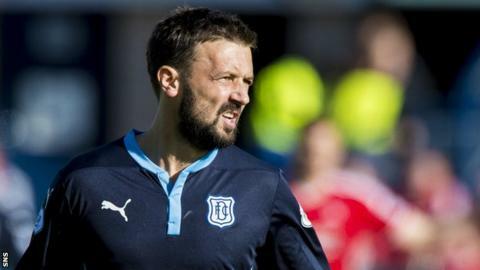 Manager Paul Hartley, whose side currently sit sixth in the Scottish Premiership, expects to make further signings as he again looks to reshape his squad. McBride began his career with Celtic before spells with Motherwell, Darlington, Falkirk, Hibernian, Raith Rovers and Hamilton Academical.